Dill, Mint, Nasturtium, Sage, Lettuce, Mustard, Kale, Endive, Tatsoi and Mizuna. 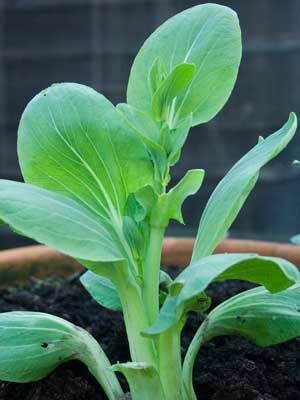 Surround stem with a 10cm (4 inch) mat with a slit cut into it for the stem to prevent cabbage root fly from destroying the roots. Use fine mesh or fleece over the summer to prevent butterflies laying eggs on the underside of leaves - caterpillars can destroy these plants. Keep soil moist in dry weather.